Aug. 29, 2013, 12:32 p.m.
By Joshua Benton @jbenton Aug. 29, 2013, 12:32 p.m.
Now you can do the same on your WordPress-based site. Most of the work here is done by a year-old WordPress plugin called Tweetable Text, written by Salim Virani. (You can see it in effect on his site.) It does the job, but there were a few things I wanted to change: improving how the highlighted text and hover buttons are displayed; avoiding its use of Twitter’s tweet button code; and allowing the text-to-be-tweeted to be different from the exact text that is highlighted in the story. So I made those and a few other small changes in Salim’s code; you can check out my new version of the WordPress plugin right here. — Download this file; unpack it, and upload tweetable-text.php to your WordPress plugins directory. Activate the plugin in your WordPress interface. Schardt says that [tweetable]finding creative journalists with an awareness of what technologies are available to them is half the battle. [/tweetable] The advancements themselves outpace the average newsroom’s awareness and ability, but funding continues to be overwhelmingly aimed at furthering these platforms — while journalists struggle to keep up. Schardt says that [tweetable alt="This is actually the text that will show up in the tweet. "]finding creative journalists with an awareness of what technologies are available to them is half the battle. [/tweetable] The advancements themselves outpace the average newsroom’s awareness and ability, but funding continues to be overwhelmingly aimed at furthering these platforms — while journalists struggle to keep up. Schardt says that [tweetable hashtag="#journalism #publicmedia"]finding creative journalists with an awareness of what technologies are available to them is half the battle. [/tweetable] The advancements themselves outpace the average newsroom’s awareness and ability, but funding continues to be overwhelmingly aimed at furthering these platforms — while journalists struggle to keep up. POSTED Aug. 29, 2013, 12:32 p.m.
Benton, Joshua. "If you use WordPress, you too can have tweetable sentences like in that New York Times SNL story." Nieman Journalism Lab. Nieman Foundation for Journalism at Harvard, 29 Aug. 2013. Web. 19 Apr. 2019. Benton, Joshua. "If you use WordPress, you too can have tweetable sentences like in that New York Times SNL story." Nieman Journalism Lab. Last modified August 29, 2013. 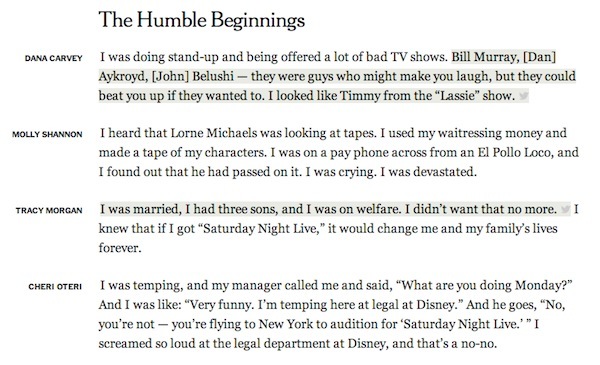 Accessed April 19, 2019. https://www.niemanlab.org/2013/08/if-you-use-wordpress-you-too-can-have-tweetable-sentences-like-in-that-new-york-times-snl-story/.